The post man arrived today with more goodies for the mountain wheelchair; another 8 LiFePo4 batteries, a 48v LiFePo4 charger, a 3.65v LiFePo4 charger and a new multi-meter. In the post mentioned above, I’d connected the wheelchair batteries to a set of motors to try and discharge them. It took days (literally) of leaving two 300w motors running to get the battery cells down to about 3v each. 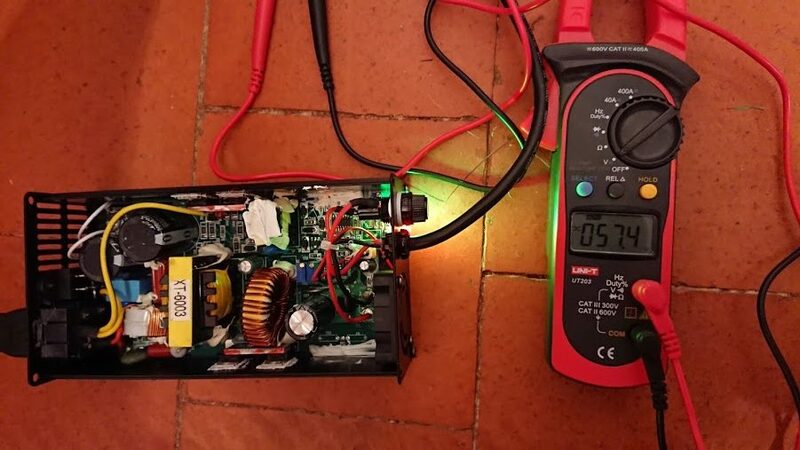 As there were 8 batteries in the pack, I needed to get the pack down to about 24v (8 * 3), and as was to be expected, the voltage remained stable for days then suddenly started to plummet. At this point I disassembled the battery pack and started to discharge them individually. Whilst in the process of discharging the batteries, I noticed that my old multi-meter is giving different readings to my new one. To see which one was wrong, I got hold of a third one and lo-and-behold, the multi-meter that I’ve been using for the last 20+ years is reading higher voltages than it should do. 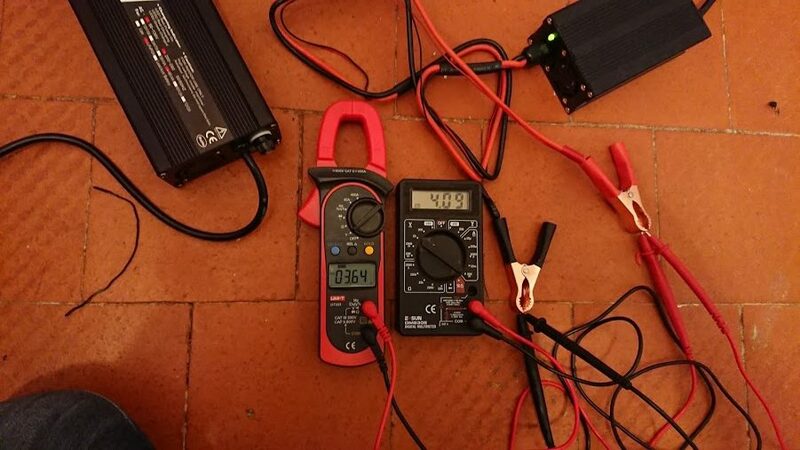 Hooked up to a 3.65v charger, the old one is giving me a reading of 4.09v! I’ve no idea how long it’s been like this but it’s likely that I’ve been using the wrong measurements for years. Oops! 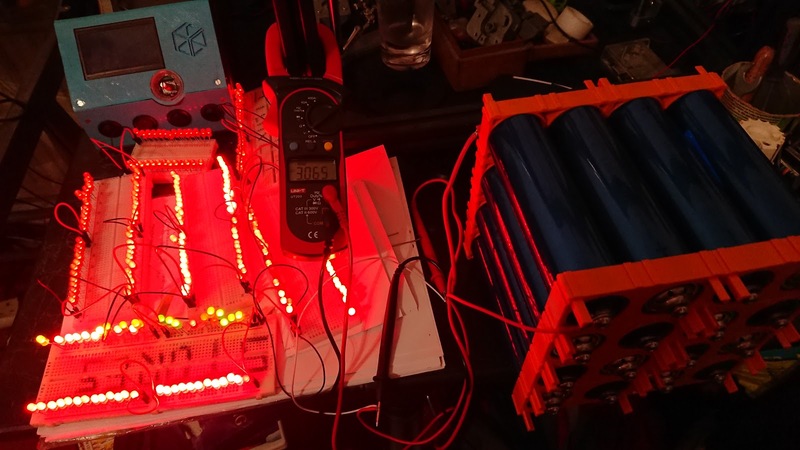 The good news is that at least now I know I have one that is accurate and I can go about getting all of these battery cells to exactly 2.750v. 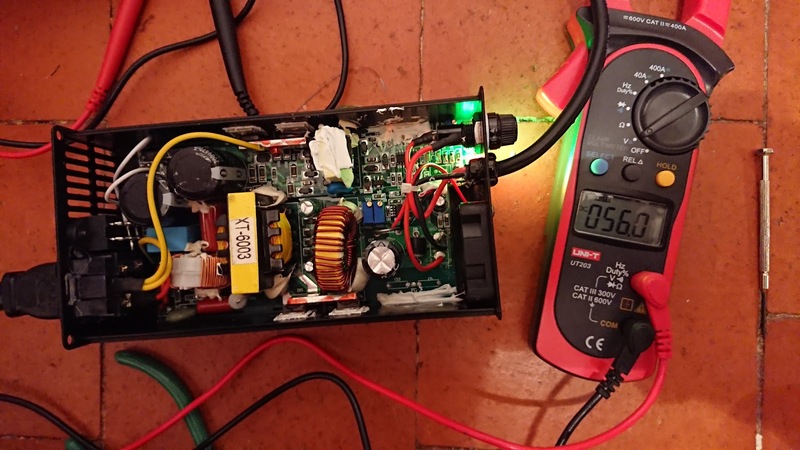 Anyway, I’m digressing somewhat; the reason for writing this post is because I wanted to share a modification that I’d made to the 48v LiFePo4 charger. In my previous post (see link above) I explained that after bottom balancing all of the cells to 2.750v, I will then wire all of the cells in series to give me a 48v battery. To this end I purchased a 48v LiFePo4 charger. From the factory, it charges the batteries up to 57.6v (which is about normal for a 48v charger). If there are 16 cells in the pack, then that means 3.6v per cell (57.6 / 16). This presents a problem because as was shown in my previous post, the charge/discharge curve for LiFePo4 cells is very steep at both ends. As a cell starts to reach its maximum charge, it suddenly starts to shoot up. If one cell were to reach 3.6v before the rest of the cells in the pack then its voltage would increase faster than the others and likely result in permanent damage to that cell. The absolute maximum voltage these cells can safely handle is about 4.2v but I’ve decided to aim for 3.5v to give the whole system a bit of “room to breath”. This meant that I needed to modify the battery charger. Rather than have a charger that tops out at 57.6v, really what I wanted is a charger that tops out at 56v (3.5 * 16), so I went ahead and opened up the charger. My luck was in as I found that it had a very small adjustable VREF relay. By making a small adjustment to this, I now have a charger which tops out at exactly 56v and is perfect for charging the batteries safely. For anybody else wanting a charger which tops out at 56v, I purchased this one from Eclipse Bikes. The adjustable vref can be found on top of a small blue relay next to the green/red lights and is labelled VR2 on the circuit board. Obviously this will void the warranty and more importantly; the charger is running off 240v mains supply so there is inherent risk involved. For me it’s been a pleasant surprise and I now have a means to charge the mountain wheelchair without damaging the batteries. The 6 hub motors previously ordered have successfully passed UK customs, and I’ve also gone ahead and ordered 6 motor controllers to go with them. When they arrive I’ll have everything I need (apart from a few small pieces) to make an actual moving vehicle. Yeah, I’m making progress with the mountain wheelchair!! !